A dog named Jacob is helping to comfort the community in Parkland, Florida, after a mass shooting at a high school. 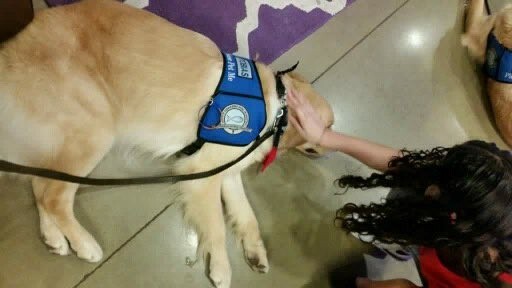 By petting and stroking golden retriever Jacob, it is hoped people will begin to relax and experience a lowering of blood pressure. Jacob was dispatched to Florida as part of the Lutheran Church Charities (LCC) K9 division following the February 14 shooting at Marjory Stoneman Douglas High School. The attack claimed the lives of 17 people, including young students. Jacob is just one of LCC’s purebred golden retrievers who arrived in Parkland to bring comfort to survivors and first responders. Tim Hetzner, president and chief executive of LCC, told the Press Association: “When a disaster or crisis occurs, we deploy them out to bring comfort to people who are suffering. “When someone pets one of our LCC K9 comfort dogs it lowers their blood pressure and makes them relax. When they relax, they can talk about what they have gone through, which is an important part of the healing process. Our LCC K9 comfort dogs are confidential, show unconditional love, are excellent listeners, and never judge those they serve,” added Hetzner. The LCC K9 comfort dogs travel to where they are invited and are free of charge. They rely on outside support to cover transportation, hotel and meal costs. In the past two years, Jacob and LCC have helped those affected by the Pulse nightclub shooting in Orlando in June 2016, and the Las Vegas shooting in October 2017. LCC K9 comfort dogs have their own Twitter and Facebook pages, where Jacob has a group of loyal fans who have been giving their support to those affected. Jacob comforted children and teenagers at a prayer vigil at Parkridge Church for victims and survivors of the recent shooting. The 17 people killed were remembered at a candlelight vigil attended by at least 1,000 people on Thursday. There was a moment of silence, and the victims’ names were read aloud. 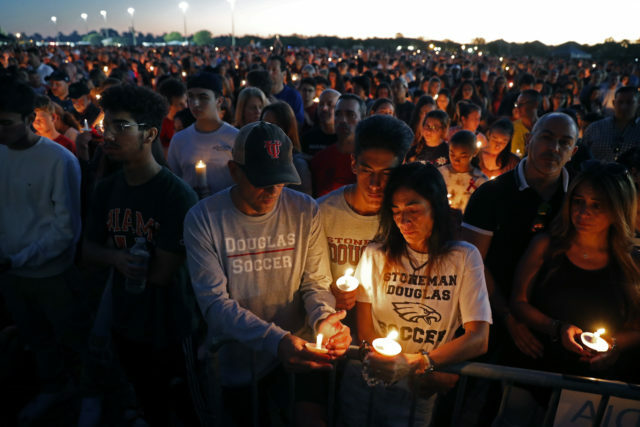 Some wore red, the Marjory Stoneman Douglas High School colour. A 19-year-old has been charged with 17 counts of premeditated murder.